Don’t be fooled by her Jamie Lynn Spears looks, her innocent demeanor or the flawless skin and hair……Ashley ‘Z’ has a PhD from the Graduate School of Hard-Knocks, a Masters degree in Raising Hell (and heartbeats) and did her undergraduate work at The Academy……..that would be the world famous Ryan Seacrest Broadcasting Academy For Underprivileged Humble Misfits. 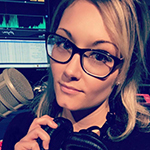 A broadcaster by trade and a branding voice by default, she’s been used for imaging by almost every PD she has worked under……for FREE. Sadly (for y’all), those days are now over. Check out her work below. She’s worth a handsome retainer agreement and then some! Ashley ‘Z’ PhD…..poor, hungry and driven.